Fillings, or more formally, dental restorations, are performed on teeth which have lost function, integrity, or morphology. These teeth need to be “filled” with a strong material to replace the missing tooth structure. The loss of structure is most often due to caries (cavities) or trauma—such as biting down on something solid while chewing and breaking your tooth. The restorative materials used in a filling can be made of various materials, but dental composite is the most widely-used and effective material today. 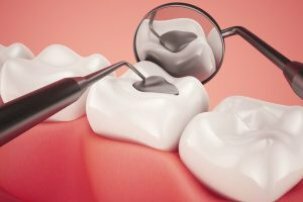 Dental composite, or “tooth-colored” restorations, are fillings made from synthetic resins which are bonded to the patients tooth with a very strong adhesive. There are many advantages to these restorations. Because less composite can be used, the fit and mouth feel of these fillings is far superior. They can also be used effectively for serious caries or trauma where much of the tooth has been lost. Thanks to advances in bonding technology, this allows a dentist to perform a more conservative filling, meaning less structure is removed to prepare the tooth. Acid etching allows the dentist to remove only microscopically small amounts of enamel to roughen the surface for bonding. The new bonding technologies help restore teeth to their original integrity and strength. These composites are also much more pleasing in appearance than traditional silver fillings. Contact Downtown Dental today to learn how we can take away the tooth pain and restore your smile. At Downtown Dental, we stand behind every dental service we provide to our patients.We are confident in our quality of work and support it with a warranty which very few dental offices offer. We will repair or replace the restorative dental treatment at no fee rendered based on the following guide lines and exclusions for a period of 24 months from the date of service. Failure to fulfill the following requirements will void the dental treatment warranty.